On a rare smoking hot summer evening I headed down to Brixton’s Champagne Plus Fromage to enjoy a taster evening with co-founder Maud Fierobe. 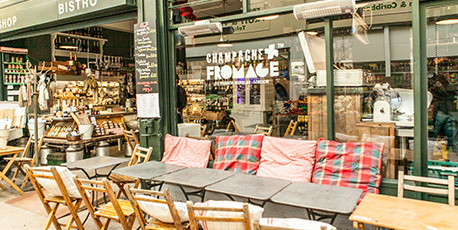 Champagne Plus Fromage is a collaboration between French Bubbles who import award winning limited production grower champagne and Une Normande à Londres, a family owned company who bring to London the very best artisan cheese, cured meat and preserves from across France. The shop and bistro (there is also one in Covent Garden and another recently opened in Greenwich Village) serve beautiful artisan food within their bustling rustic interior with shelves piled high with jars of terrine, rillettes, cassoulets and delicious confits. Their Fromagerie serves over 50 different types of soft and hard cheeses and a selection are expertly paired to compliment the 4 different Champagnes we would be drinking that evening. The bistro is as charming as Maude herself who stood at the head of the table and introduced all of the wines to us and explained how they had been made. Here wine education began reluctantly as a sulky child being dragged around vine yards with her parents in France (I have similar memories but of Asda in Walsall). The process is laborious and hasn’t changed much since it’s inception – making the price tags a bit more palatable. I loved the paring of the Michel Furdyna Reserve Brut pilot noir champagne with Tartine Auvergne (soft figs on the light and creamy melted Fourme d’Ambert cheese) and also the soft and crumbly Langres that was marinated in champagne and served with the deliciously sweet Lacroix Demie-Sec. The evening was pretty magic! Sipping champagne in Brixton Village is perfect way to spend a sizzling summer evening and I’m totally smitten with Maude. A calendar of weekly tasting events run at both the Brixton Village and Covent Garden bistros and I’m already arranging a visit for when my mum is next in town.